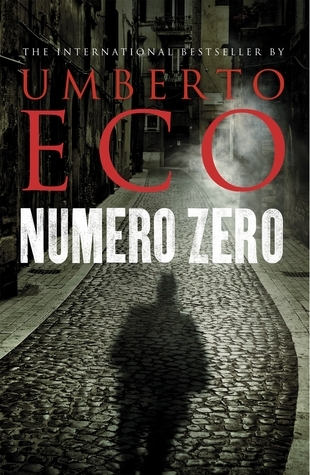 Numero Zero (2015) is the seventh and last novel of the Italian author Umberto Eco (1932 – 2016), but it’s a bit of a disappointment. It’s mildly amusing, but not in the same league as The Prague Cemetery (2010), (see my review) not as much fun as Baudolino (2000) and certainly not comparable with The Name of the Rose (1980). As a satire about tabloid journalism Numero Zero is reasonably successful but as an exposé of conspiracy theories it’s a boring flop, and both of these are easy targets anyway. The plot is simple: a hack journalist is hired to write a memoir of the creation of a dummy newspaper. The idea is that ‘investigative journalism’ will smear the reputation of a businessman with innuendo and that he will submit to blackmail to prevent these stories surfacing. This device allows Eco to frame team meetings of the journalists to determine ‘editorial policy’ and explain the techniques of tabloid journalism – but since anyone who’s done Journalism 101 knows these tricks anyway, these ‘revelations’ are obviously directed at the reader. Define your audience and give them what they want. By definition they will be under-educated, energised by law and order issues, and intrigued by gossip and the misfortunes of others. Stick to simple language. Clichés can be used and abused at will. Since a daily newspaper can only ever summarise last night’s TV news, its role is to speculate about what might happen tomorrow. Appear to respect the fundamental principle of democratic journalism by giving the appearance of separating fact from fiction. Commentary on any event should include two opinions from the ‘man in the street’, one of them being more ‘respectable’ than the other, giving the impression of two facts, one of them being more credible. Most commonly convincing is the one who is critical, pointing the finger of blame. Set an agenda in order to pass on opinions. Under the right headline, disparate stories can be used to create an ‘issue’, for example, four crime stories originating from Southern Italy (even if they’re not really reporting on a crime) can imply a warning that the South is the home of dangerous criminals. If someone defamed by innuendo objects, deny the denial by referring to (unspecified) sources, to a journalist’s (non-existent) notes as an authentic record; and suggest doubts about the reliability of the person. It was inevitable, I suppose, that any character who’s a conspiracy theorist is going to be a crashing bore who doesn’t know when to stop, but really, Eco should have known better than to have risked his reputation as a fine writer with the character of Braggadocio. Braggadocio’s motto is ‘Suspicion never goes too far. Suspect, always suspect, that’s the only way you get to the truth.’ He questions everything from the Moon Landing to the Gulf War, and then he launches into five pages (I kid you not) of incredibly boring car specifications in order to prove that car manufacturers hide the flaws in their cars to mislead consumers. It gets worse, because he has convinced himself that the Mussolini who was killed by Italian Communists in the closing days of WW2 was actually a double, and the real one stayed in hiding with the support of everyone from the Vatican to the CIA. There are pages and pages of this, and while it’s probably an authentic way of depicting a conspiracy theorist at work, it is tedious beyond redemption. Numero Zero is only 190 pages long, so I kept going, trying to identify what Eco was on about. He was a fiercely intelligent man, but I can’t see that he’s done much in this novella other than offer an unsubtle critique of modern journalism and an unfunny mockery of conspiracy theorists. Alberto Manguel, writing in The Guardian (who also wasn’t impressed) makes a connection with Borges’ spoof of poetic truth with the story of Pierre Menard (who set out to re-author Cervantes Don Quixote by becoming, as it were, a 17th century Spaniard with the same experiences as Cervantes), but IMO it’s drawing a long bow. Lots of books spoof truth and reality. I have only just read Labyrinths so it’s fresh in my mind, but even the discovery that Borges’ was Eco’s literary hero doesn’t convince me that this book owes anything much to Borges. Michaela McGuire in the SMH found it disappointing too. It’s a shame, really. It’s sad to think that some readers coming new to Eco might choose this one first because it’s short, and decide that they don’t like his work on the strength of it. The only work of Umberto Eco that I have read was Foucault’s Pendulum. I did not enjoy that much. Maybe I will try reading the other books you have mentioned in this review. I haven’t read that one, and I think I need a bit of a break from Mr Eco before I hunt out a copy! Maybe we’ve seen the last of his great novels… it is sad. I read, many years ago Foucault’s Pendulum and the Name of the Rose and enjoyed them. Eco’s a writer like Lodge who enjoys displaying his great knowledge of literary theory. Glad you read this one for us, now I don’t have to.